﻿ Cincinnati Ohio's Premier Personal Fitness Training! Customized training is the fastest, most effective and most legitimate weight loss and fitness enhancement strategy available. Cincinnatians are seeing stunning results with the Essentials package - strength, metabolic, cardio training that delivers a lean, healthy body. Fun, affordable and it works! All shapes, sizes and abilities are seeing great results. 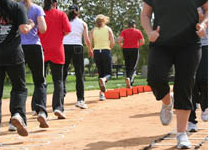 If you're tired of the same routine, come try this new approach to exercise...fun! At HealthStyle Fitness we believe that living in a healthy, fit and vivacious body is essential for quality of life in 2013. We believe fitness should be simple and fun. We believe your workout facility should be energizing, supportive, and friendly, where everyone is excited you when you come in. Modern day technological advances now require that we make time to move and eat better in order to LOOK, FEEL and PERFORM like our bodies are designed. Our mission is to cut through all the CRAZY hype & gimmicks, and give you the time-tested tools and skills for success, so you can enjoy your healthy lifestyle. We deliver cutting edge fitness through professional instructor-guided programs that continually evolve to bring about positive results in your health, energy and body. Clients choose one of two options: The Essentials package; or the Customized package. Brian Calkins has been honored as one of the nation's top 50 personal trainers, his company has been featured in THE WALL STREET JOURNAL, and countless other media outlets nationally and locally.